WSJ reporter JaeYeon Woo spent two nights in solitary confinement at "Prison Inside Me," a jailhouse-themed retreat in South Korea. HONGCHEON, South Korea—It is still dark. The chilly air leaks in at the windowsill. There's no clock on the wall. Park Woo-sub assumes he needs to wait a bit longer for breakfast to be served through a slot at the bottom of the door to his solitary cell. "This is my third time in prison," says the unshaven 58-year-old who looks as if he has had a sleepless night. He is wearing a regulation blue uniform with an ID number on his chest. He closes his eyes and tries to meditate. It isn't that there is anything else to do in the 60-square-foot cell whose only furnishings are a toilet, a tiny sink and a table. Many random thoughts swirl about in his head. "Being confined to a prison can be suffocating, but it also offers time to focus solely on me and spend some quiet time with myself," he says. In his earlier incarcerations, he was behind bars for participating in the democratization movement that swept across South Korea in the 1980s. This time, he was admitted voluntarily. He walked into the cell and locked himself in. In a country where the social pressure to do well in school and to find highly paid jobs is intense, an industry is attempting to come up with some extreme relaxation. In the middle of nowhere on the outskirts of Hongcheon, 58 miles northeast of Seoul, Kwon Yong-seok runs "Prison Inside Me," a stress-reduction center with a penal theme. A meditation building, auditorium and management center sit on a 2-acre piece of land. "I didn't know how to stop working back then," said the soft-spoken 47-year-old Mr. Kwon, looking back on his life as a public prosecutor on Jeju Island in the late 1990s. "I felt like I was being swept away against my will, and it seemed I couldn't control my own life." One day, Mr. Kwon asked a prison governor, who was an old acquaintance of his, whether he could spend a week behind bars—for therapeutic reasons. That was out of the question, he was told. Besides, he himself felt that a whole week would be too long a stay. Although South Korea is slowly inching toward a better work-life balance, with the government and businesses emphasizing the importance of taking longer vacations in a somewhat paradoxical effort to improve productivity, people still work notoriously long hours. The latest available data compiled by the Organization for Economic Cooperation and Development show South Koreans worked the longest hours among 34 OECD members in 2011, after Mexico, with 2,090 hours a year. The OECD average was 1,765 hours. Too much work is a quality-of-life issue. The country ranked 26th in the Life Satisfaction category of the annual Better Life Index for 2013, an OECD measure of how people evaluate the quality of their lives. South Koreans gave their lives a 4.3 on a scale of 0 to 10, lower than the OECD average of 6.6. In June last year, the construction of the prison-like spiritual house was completed. It took a year and cost Mr. Kwon and his wife Roh Ji-hyang, head of a theater company, 2 billion won, or $19 million. Parts of the cost were covered by donations and loans from friends and relatives. Mr. Kwon says the goal of the facility, which has 28 solitary confinement cells, isn't to make a profit. On top of private meditation sessions, paying guests are helped to reflect on their lives and learn how to free themselves from what Mr. Kwon calls the "inner prison," through meditation, spiritual classes and "healing" plays in a group session in the auditorium. A two-night stay costs 150,000 won or about $146. 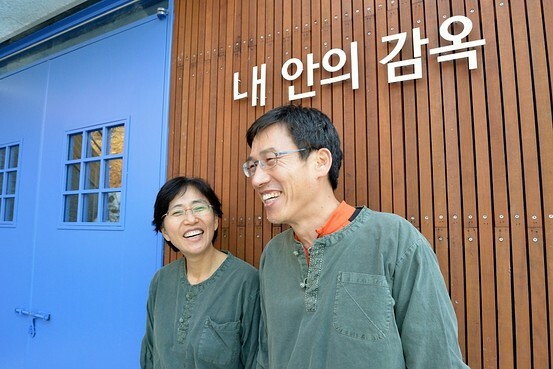 So far, it hasn't been as easy for the couple to run the place as they had envisioned. They had to cut the length of stays to as little as two days because people aren't willing to, or simply can't, take time off. Also the facility had to make another big concession to modernity—allowing guests to check their smartphones at least once a day. "People seem nervous without a phone and simply worry too much about an emergency, which seldom happens," said Mr. Kwon. One recent morning, about 20 people attended a personality analysis class conducted by a Catholic priest, a session aimed at helping participants understand themselves as well as others, one of the essential elements to finding "inner peace," according to Mr. Kwon. As soon as a short break started, people rushed to grab their phones. "Someone might have called me or left a message," said Park Seong-ho who quickly swiped the screen to see whether any new messages had arrived. While generally satisfied with the quality of programs, "it would have been more helpful for self-control if the facility had been in poorer shape like in a real prison," Mr. Park said, "it is too clean and warm to be called a prison." 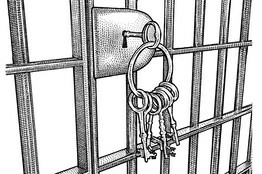 Life in prison, though physically constrained, can be free in that there is less pressure from modern living. Some of the country's intellectuals and political dissidents have said they found inspiration and peace of mind while serving time in real prisons. Former South Korean President Kim Dae-jung, who was an avid reader, once famously said, "I wish I could go back to prison," complaining that he lacked time to read books because of his busy schedule. The former president, who won the Nobel Peace Prize in 2000, spent six years in prison and nearly 10 years under house arrest for his democratization movements. His writings in jail were later published under the title of "Prison Writings." Another famous book, "Thoughts From Prison" by Shin Young-bok, a political dissident-turned-professor, became a classic for its thought provoking self-examination. "To be honest, the two-day-three-night program is too short. But the reality is people complain if we make it longer," Mr. Kwon said, "I only wish people could get a rare chance, even if forcibly, to reflect on the past and take it easy." 사위는 아직 어두컴컴하다. 창틀 사이로 냉기가 스며든다. 벽에는 시계가 없다. 박우섭 씨(58세)는 독방 문 아래쪽 틈으로 아침식사가 들어오려면 좀 더 기다려야겠지, 라고 생각한다. 그는 불면의 밤을 보낸 듯, 면도도 하지 않은 다소 초췌한 모습으로 “이번이 세 번째 수감생활”이라고 말했다. 그는 파란색 수의 차림이다. 가슴에는 번호표가 붙어있다. 그는 눈을 감고 정신을 집중해보려고 애쓴다. 화장실과 작은 세면대, 책상밖에 없는 1.68평(약 5.57m²) 남짓한 공간에서는 사실 명상 말고는 달리 할 일도 없다. 그의 머릿속에 무수한 잡념이 꼬리에 꼬리를 문다. 그는 1980년대 한국을 휩쓴 민주화 운동에 참여했다가 구속된 전력이 있다. 이번에는 수감을 자청했다. 제 발로 감옥에 들어와 스스로를 가둔 것이다. 학교에서는 좋은 성적을 내야 하고 졸업하면 고액 연봉을 받는 직장에 취직해야 한다는 사회적 압박이 심한 한국에 다소 극단적인 방법으로 심신의 휴식을 제안하는 이색 장소가 등장했다. 권용석 이사장(47세)은 강원도 홍천의 허허벌판에 교도소를 표방한 명상 센터 ‘내 안의 감옥’을 만들었다. 2,448평(약 8,093m²) 정도의 부지에 수감동과 강당, 관리동이 자리하고 있다. 권 이사장은 어느 날 오랜 지인인 교도소장에게 치유 목적으로 일주일만 수감생활을 하게 해달라고 부탁했다. 불가능하다는 답변이 돌아왔다. 그가 생각하기에도 일주일이라는 체류 기간은 일을 놓기에는 너무 긴 것도 같았다. 정부와 기업은 근로자들에게 휴가를 길게 쓰라고 강조하는 등, 한국 사회가 일과 삶이 균형을 이루는 방향으로 조금씩 발전하고 있긴 하지만 한국인들은 여전히 장시간 근로에 시달리고 있다. 2011년 경제협력개발기구(OECD)가 발표한 데이터에 따르면 한국인의 연간 근로시간은 2,090시간으로, OECD 34개국 가운데 멕시코에 이어 두 번째로 많이 일하는 나라인 것으로 나타났다. OECD 회원국 평균 근로시간은 1,765시간이었다. 장시간 근로는 삶의 질을 해칠 수 있는 이슈다. 2013년 OECD가 실시한 ‘삶의 만족도’ 조사에서 한국은 26위를 차지했다. 한국인들은 자신들의 삶에 대한 만족도를 4.3점(만점은 10점)이라고 평가했다. 이는 OECD 평균인 6.6점에 못 미치는 수준이다. 노지향씨와 권용석씨. 부부는 함께 ‘내안의 감옥’을 운영하고 있다. ‘내 안의 감옥’은 지난해 6월 완공됐다. 권 이사장과 극단 “해”의 대표인 그의 아내 노지향 씨는 1년 동안 20억 원을 들여 독방 28개를 갖춘 이 명상 센터를 지었다. 공사비는 기부를 받기도 하고 친지들로부터 빌리기도 했다. 권 이사장은 돈을 벌기 위해 센터를 만든 것이 아니라고 말했다. 방문객들은 독방에서 혼자 명상하는 시간 외에도 강당에서 단체로 명상 수업과 힐링 수업을 받으며 ‘내 안의 감옥’에서 해방되는 방법을 배우고 인생을 반추하는 시간을 갖는다. 부부가 처음 꿈꿨던 대로 센터를 운영하는 것은 쉽지만은 않았다. 부부는 체류 기간을 최소 이틀로 줄일 수밖에 없었다. 사람들이 시간을 낼 의지가 없거나 또는 휴가를 마음대로 낼 수가 없기 때문이다. 또한 현대인들의 일상생활에서 빼놓을 수 없는 한 부분도 허락했다. 하루에 최소 한 번 정도는 스마트폰을 확인할 수 있도록 것이다. 권 이사장은 이렇게 설명했다. 최근 어느날 아침, 20명 여명이 카톨릭 사제가 진행하는 성격 분석 강의를 듣고 있었다. 나 자신과 타인을 이해하는 것이 강의의 목표다. 권 이사장은 ‘내 안의 평화’를 찾기 위해서 나와 남을 이해하는 것이 반드시 필요한 요소 가운데 하나라고 말했다. 쉬는 시간이 시작되자 사람들은 황급히 휴대전화를 집어들었다. “누가 전화를 했을지도 모르고 문자를 남겼을지도 모르잖아요.” 한 참가자 박성호 씨는 서둘러 스마트폰 잠금을 해제하고 새로운 메시지가 오지 않았나 확인했다. 박 씨는 프로그램의 질(質)에 전반적으로 만족한다면서도 시설이 진짜 감옥처럼 열악했으면 자기 절제에 더 도움이 됐을 것 같다며 이렇게 말했다. 수감생활은 육체적으로는 제약을 줄지언정 숨 가쁜 현대생활에서 해방된다는 점에서 정신적으로는 자유를 준다. 실제로 수감생활을 하면서 마음의 평화를 찾고 영감을 얻었노라고 얘기하는 지식인들과 정치 운동가들이 상당수 있다. 독서광이었던 김대중 전 대통령이 바쁜 일정 때문에 책 읽을 시간이 부족하다며 “책을 읽기 위해 감옥에나 한 번 더 가야 할 모양”이라고 얘기한 일화는 유명하다. 2000년 노벨 평화상을 수상한 김 전 대통령은 민주화 투쟁 과정에서 6년 동안 감옥살이를 했고 10년 동안 가택연금을 당했다. 김 전 대통령은 수감생활 중 쓴 글을 모아 ‘김대중 옥중 서신’이라는 책을 출간했다. 통일혁명당 사건으로 구속됐던 신영복 교수의 ‘감옥으로부터의 사색’도 자기성찰을 일깨우는 옥중 서간집의 고전이다. 권 이사장은 이렇게 말했다.